We are winding down the week here at the Heartworks House and want to wish everyone a Merry Christmas and say thank you for all the love that has expanded our hearts this month. This note is meant for anyone who took part in our efforts or for anyone looking for inspiration to reach out beyond their own family this Christmas. The month started with our December meeting that was filled with so many authentic prayers and continued with the night of stocking filling that seems to have expanded the lives of everyone who gathered. Our Tuesday morning meditations have been about staying grounded and honoring those who are struggling with illness and grief this year by keeping things in perspective. Our book club on December 20th was a powerful discussion on saying YES to possibility. 76 lights were purchased for our fundraiser of spreading light in the darkness of illness and grief, which provided $7,600 we were able to give out to families in the form of meals, experiences, and gifts to make their holidays a little more tolerable. 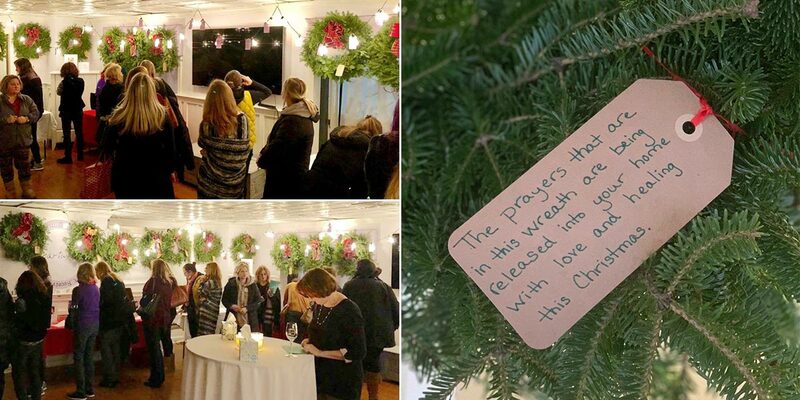 We delivered 30 wreaths filled with prayers from over 75 women to people for whom this may be the only decoration they feel like hanging this year. 44 stockings were filled with love, prayers, gift cards, candy and trinkets for children. Grocery and restaurant gift cards were given out to help with holiday expenses and to encourage big family meals. 5 sizable checks were given to families with serious medical bills that were deterring them from buying gifts this year. Families are receiving weekends away for this time when they are feeling it is just too difficult to stay home for Christmas or New Years Eve. A teenage girl who has been out of school for 3 months is getting a new laptop this year. Catered dinners and family gatherings are being provided for families too sad or sick to organize themselves. Houses and trees were decorated for people with bigger fish to fry than putting lights up. 4 gift cards given to kids living their first Christmas without their mothers so that they can buy each other gifts. 19 candles delivered to light for people missing at tables this year. Thank you for joining us in expanding the idea of gratitude and kindness. Thank you for helping us to live full lives that include such deep connections with other human beings, as well as with God. As this year comes to a close, we look forward to our 15th year of practicing awareness, receiving, giving and gratitude. THANK YOU for believing in our mission and for participating in bringing light into the world. Hosted by our Jr. Heartworkers, the Gingerbread Open House fundraiser has become an annual family tradition with all proceeds going towards sending kindness to kids living with illness. Kids are welcome to come to the Heartworks house and decorate pre-assembled gingerbread houses with icing and candy and we clean up the mess! Click here to Reserve your House today! !